Carlsbad, California – November 13, 2013 – Pulse~LINK, Inc. announced today that it has been selected as a finalist in this year’s Fierce Innovation Awards: Telecom Edition, an operator-reviewed awards program from the publishers of FierceWireless, FierceTelecom and FierceCable. Pulse~LINK was recognized as a finalist in the category of Home Networking. Pulse~LINK was selected as a finalist for its innovative, industry leading product, CWave® Life~LINK. Finalists were selected by an exclusive carrier-only panel of executives from AT&T, Cablevision System Corporation, Comcast, Cox Communications, MetroPCS, Rogers Communications, TeliaSonera International Carrier and Verizon. Full profiles of the judges can be found at https://www.fierceinnovationawards.com/telecom/2013/judges. All applications were evaluated based on the following criteria: technology innovation, financial impact, market validation and end-user customer experience. Finalists were selected based on the judges’ scores in each area. Pulse~LINK’s CWave® offers the highest throughput of any Ethernet-over-coax solution. Designed with HD video streaming in mind, CWave® delivers hundreds of megabits throughout the home over existing coax. CWave® Life~LINK’s built-in Wi-Fi extender turns any room into a Wi-Fi hotspot, delivering flawless HD to the furthest reaches of the house. Current publications include: Energy: FierceEnergy; FierceSmartgrid; Telecom: FierceWireless; FierceCable; FierceDeveloper; FierceOnlineVideo; FierceTelecom; FierceWirelessTech; FierceWireless:Europe; Healthcare: FierceEMR; FierceHealthcare; FierceHealthFinance; FierceHealthIT; FierceHealthPayer; FierceMedicalImaging; FierceMobileHealthcare; FiercePracticeManagement; Hospital Impact; Life Sciences: FierceBiomarkers; FierceBiotech; FierceBiotechIT; FierceBiotech Research; FierceCRO; FierceDiagnostics, FierceDrugDelivery; FierceMedicalDevices; FiercePharma; FiercePharmaManufacturing; FierceVaccines; Enterprise IT: FierceBigData; FierceCIO; FierceCIO:TechWatch; FierceContentManagement; FierceMobileIT; FierceEnterpriseCommunications; Finance: FierceCFO; FierceFinance; FierceFinanceIT; Government: FierceGovernment; FierceGovernmentIT; FierceHomelandSecurity; and FierceMobileGovernment; Marketing &Retail: FierceCMO; FierceMobileRetail; FierceRetail; and StorefrontBacktalk. 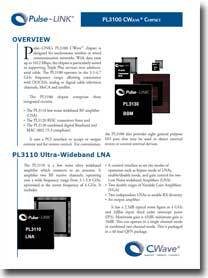 Pulse~LINK, Inc. is a fabless semiconductor company with more than 300 issued and pending telecommunication patents. Headquartered in Carlsbad, California, Pulse~LINK is the inventor of CWave®, an innovative, simple digital RF architecture enabling high data-rate home networking over coax.